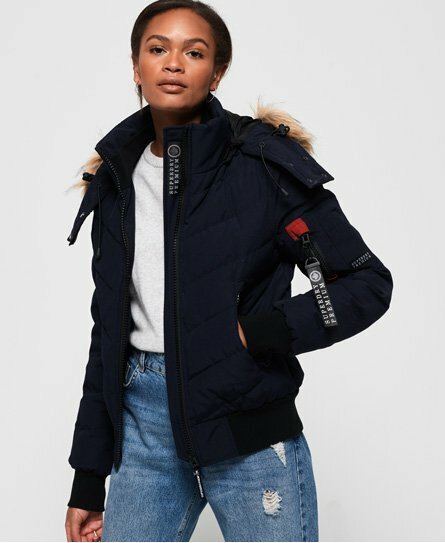 Superdry women’s Premium down quilt bomber jacket. Don’t let the weather hinder your style this season, invest in our premium down quilt bomber jacket. With 90/10 down filling, this jacket will help keep you protected from the elements this season. This jacket features a bungee cord removable hood, a single zip fastening, three zip pockets and ribbed cuffs and hem. For the finishing touches to this luxurious jacket, it has a Superdry patch on the pockets and arm and Superdry branded zip pulls. Team this jacket with your favourite skinny jeans and boots this season for a stylish, casual outfit.